Exploding Doughnut: Getting it all out. I've cried a lot these past couple of days. A person can only hold it in for so long. When will I be done with them already? There's the life I have and there's the life I want. I fear the two will never meet. When I go to work, I'm thankful to be there and for my coworkers. At the same time, the positions I have are as far as I'll be able to go. Besides my art, I have no other skill-set and my simple income has pretty much plateaued. At 36 years-old, that's just discouraging. And I have yet to find a man that will accept me as I am and love me with everything he has. I'm ashamed to be me and doubt my life will ever become what I dream it to be. It's moments like these that make me wish I killed myself long ago. There was too much sickness in me and it screamed to get out. I felt a release and relief when this was completed. Thank God. Sadly, this'll be be my first real piece of art created this whole year. I wish things were easier. I wish I knew what to do. I wish I wasn't alone. Deep in my heart, I still love you though, Dean. That's a powerful piece of art. I'm glad you felt some relief after you had expressed those feelings. Of course, you know that those feelings are not really accurate. You know how much your co-workers and those you deal with you like you, that is, find you lovable. Very few people get to live the lives they dreamed of. One element of happiness is to realize what is good in our lives — as you do when you feel thankful for your work and your coworkers. Still, I realize that not having any assurance of better things to come can be discouraging and sad-making. But through all the good things and the discouragement, I'm glad you still love yourself. Its a gift that you're able to create such beauty from your pain. I know it's hard. I empathize more than I'd like. But I'm sending you lots of good energy and prayer up there. Might not help but it can't hurt , right? Wow! This has touched me deeply. Superb art. You may well be clinically depressed. You might need an anti-depressant. If so, your mood and outlook will improve exposing the tools that you have to navigate life with a bit more hope, then creativity. Sending you a hug and a bit of warmth. 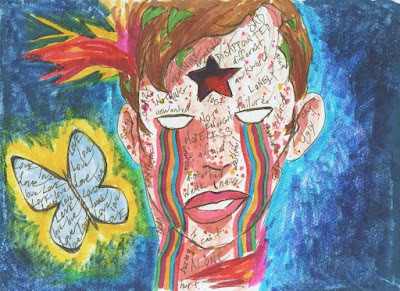 To most of the feelings that brought those beautiful rainbow tears into your eyes, boy, I could relate to, but the butterfly captured my attention like a magnet, and then "forced" me to re-focus on it every time I tried to study your painting. I don't know if would make a difference, but I wish I was there to give you a big hug. PS. Thank you for sharing your art with us. I appreciate the hugs, sir. Thank you for the good vibes/energy! Clinically depressed? Possibly. I think it has more to do with the way things are in my life in general. Everyone's supportive comments are greatly appreciated! Hi: I waited to respond because I didn't want to seem like a Polly Anna. I could be called many things but Polly Anna-ish is not one of them. Living alone, you only have yourself to bounce things off of. You can talk to co-workers, friends, family, neighbors, bag ladies, priests, pastors or rabbis, but you still go home to face yourself and your thoughts. Sometimes, you help yourself best by helping others. Whether it's giving of yourself to another person or cause or whether it allows you to focus on things other than your problems, thoughts and concerns, either way it helps. Ofcourse, you can always turn to your blog buds, too. I was concerned at first, then I realized that you got it out of your system through your art. It's like a volcano, a huge rumbling and release of heat and gas and material and it starts over, again. I can give you a great big cyber hug and tell you that you were on my mind and that I'm glad to see by your responses that you seem to be better. I wanted to be a church organist and I lived my dream until I got married and my wife couldn't accept that I was dedicated to anything beside her. I've been doing manufacturing for 30 years now, having given up playing the organ. You work with what you got and you make the best of it and you will overcome and you will succeed. Oh, and I got rid of the wife about 20 years ago! You'll know when your ready to move on and it won't look like what you're looking for, but it will be good and you will be happy. I believe this for you with all my heart. "Sometimes, you help yourself best by helping others." I totally agree with you on this. I don't have the free time to volunteer anymore but I do try to do things for others, especially when I'm feeling less-than. I hope you're right, Randy. Thanks to both of you gentlemen for chiming in here!